It's the city and major seaport in northern Egypt, in the Nile River delta, on a ridge that separates Lake Mareotis from the Mediterranean Sea. The city was founded in 332 BC by Alexander the Great, king of Macedonia, who planned it as one of the finest ports of the ancient world. A mole (breakwater made of large stones or masonry) nearly 1.6 km (1 mi) in length called the Heptastadium (“seven furlongs”) was built to the island of Pharos, enclosing a spacious harbor. A famous lighthouse, considered one of the Seven Wonders of the World, was also built on Pharos. Another smaller harbor was open to the west. A canal joined Lake Mareotis to the Canopic branch of the Nile. 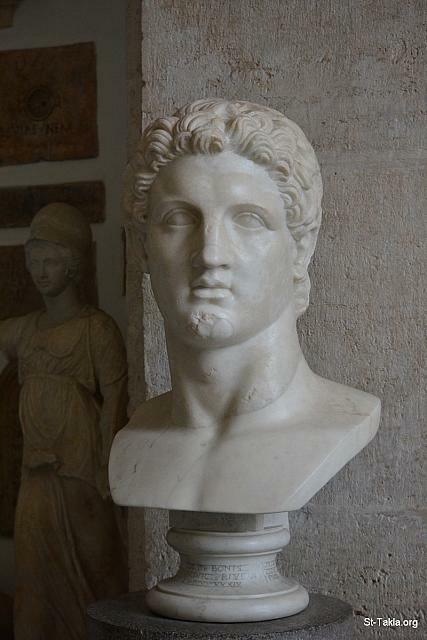 St-Takla.org Image: Ancient bust of Alexander the Great. Marble, Hellenistic artwork. from Piperno Vecchio, H. 64 cm (25 in. ), Palazzo Nuovo, first floor, great hall - Capitoline Museums (Musei Capitolini), Rome, Italy. It is located in Piazza del Campidoglio, on top of the Capitoline Hill. It was established in 1734. - Photograph by Michael Ghaly for St-Takla.org, September 21, 2014. صورة في موقع الأنبا تكلا: تمثال رخامي أثري يصور الإسكندر الأكبر، فن من العصر الهلنستي، من بيبيرنو فيكيو، طول 64 سم.، قصر نوفو، الدور الأول، القاعة الكبرى - صور متاحف كابيتوليني، روما، إيطاليا. وهو مجموعة متاحف في متحف واحد، موجود في أعلى تل كاپيتوليني، وأنشئ عام 1734 م. - تصوير مايكل غالي لموقع الأنبا تكلاهيمانوت، 21 سبتمبر 2014. The ancient city was about 6.4 km (about 4 mi) long, and regularly built, with streets crossing at right angles and colonnades adorning the principal streets. The most magnificent quarter of the city, called the Brucheium, was situated on the eastern harbor. Farther west was the Serapeion, or temple of the Egyptian deity Serapis; the Soma, or mausoleum of Alexander and the Ptolemies; the Poseidonium, or temple of Poseidon, god of the sea; the museum; the great theater; and the emporium, or exchange. The northeastern quarter was occupied by the Jews. In Alexandria the Jews came into contact with Greek learning, which profoundly influenced the later religious thought of the world; here the Greek translation of the Old Testament, called the Septuagint, was made before AD 100. Later philosophers attempted to fuse the doctrines of Christianity with the ideals of Greek philosophy. Soon after the city was founded, the population, consisting chiefly of Greeks, Jews, and Egyptians, numbered 300,000 free citizens, exclusive of slaves and foreigners. Alexandria was made the capital of Egypt, numerous palaces were built by the Ptolemies, the Alexandrian Library and Museum were founded, and influential schools of philosophy, rhetoric, and other branches of ancient learning were established. During the early 3rd century BC, the Alexandria Library had almost 500,000 volumes, the largest collection of books in the ancient world. However, the collection was destroyed over several centuries. Under the Ptolemies, the city became the literary and scientific center of the ancient world. After the defeat of Cleopatra, queen of Egypt, at Actium in 31 BC and her suicide the following year, the city came under the rule of Octavian, later the Roman emperor Augustus, and was governed by a prefect appointed by him. Its position made it the center of commerce between East and West, and fleets of grain ships sailed from Alexandria to Italy year after year. Gradually, however, the city lost its prosperity. A Jewish revolt in AD 116 resulted in the annihilation of the Jewish population and the destruction of a large portion of the city. In 215 the Roman emperor Caracalla ordered a massacre of the male inhabitants of the entire city for reasons that remain obscure but might have involved a punishment for some form of seditious conduct. The founding of Constantinople further eclipsed the Egyptian metropolis. The Muslims, under the general Amr ibn-al-As, besieged, captured, and almost destroyed the city in 638 and again about 646. Under Muslim rule the city declined, particularly after the rise of Cairo after about 968 and the opening of the sea route to India in the 15th century. Alexandria was captured and held from 1798 to 1801 by Napoleon I. The modern city is situated mainly on a peninsula about the mole, reaching to and including the island of Pharos, and on the portion of the mainland immediately south of the eastern harbor. The part of the modern city on the peninsula is a characteristically Egyptian town; the European quarter is on the mainland. Alexandria has had, since ancient times, two harbors, of which the western one is the chief commercial center and the site of the customs house and many warehouses for cotton, grain, sugar, and wool. More than 80 percent of the imports and exports of the country pass through the city. Population (1992 estimate) 3,380,000.